Well maybe it should read stuff I like and generally it seems most of the Bike Kitchen likes bikes & music & cool technology & opportunities where all this can be enjoyed. The Bicycle Music Festival and Rock The Bike are two related sites which brings all these ideas together. 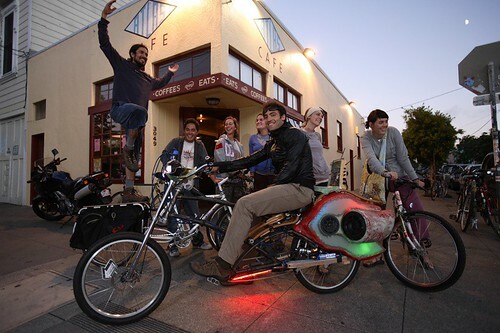 How do you like the idea of a 2000 watt pedal-powered PA system, or that the entire audience/band/stage/crew completely packs-up everything they bring (stage and musical equipment too) onto bicycles, and travels as a large group to the next festival stop. There are no sag-wagons or equipment trucks hauling the amplifiers and other heavy gear – everything is hauled by bicycle. The Bicycle Music Festival has all this and more plus 15 bands so I reckon they would have rocked out this years festival at the end of July. Do you think that Hobart deserves a Bicycle Music Festival? Interested in making it happen, let us know and we’ll see how many like minded individuals put their hand up. Highly recommend a bit of a search to check out his Flickr photostream and other articles about the making of the bike. Next Next post: We’re One!